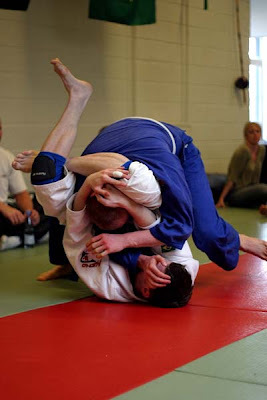 IMO, if you present BJJ as anything more than a way to have fun with your friends (i.e. handling emotions, and pressures), you set yourself up to be a guru of sorts. I do address the mental side of the game (mostly various ways to relax with the intention of feeling energy), but leave it up to the individual to see the possible value in incoperating such ideas into other areas of their lives. Being the fun, open, and caring guy you already are speaks volumes to people! If there is anything I've learned in the past few years is that is a person is preaching something, they probably aren't doing it. BTW, the 'five swords' presentation was wonderfully originally! PS Hit me up via email at mr_murgatroid@yahoo.com! I appreciate your comment, thanks much. I completely agree with letting people discover the values themselves, and I really don't want to set myself up as a guru :D I think I am writing these posts mostly for myself actually, makes me think more about things when I have to write them down. Aside from the whole setting oneself as a master/guru/whatever issue, it's true. I kinda have a hectic life with a decent amount of stress and bjj and the gym keeps me together, keeps my head screwed on straight and allows me that little bit of total zen no-worries-aliveness that allows me to get through my day and keep on trucking.